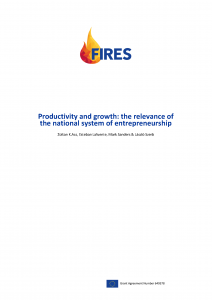 In this study we evaluate how country-level entrepreneurship—measured via the national system of entrepreneurship—impacts total factor productivity, and how the national system of entrepreneurship triggers productivity by increasing the beneficial effects of different types of entrepreneurship, namely Kirznerian and Schumpeterian entrepreneurship. Using a comprehensive database for 73 countries during 2002-2013, we employ a non-parametric technique—Data Envelopment Analysis—to build the world technology frontier and compute the Malmquist total factor productivity index and its components. The results are consistent with the notion that the national system of entrepreneurship is positively associated with total factor productivity at the country level. Additionally, the findings reveal that the national system of entrepreneurship enhances efficiency change via enhanced Kirznerian entrepreneurship in the short-run, while the positive effect on total factor productivity of Schumpeterian entrepreneurship prevails in the long run. The results suggest that public policies promoting Kirznerian entrepreneurship—e.g., increased business formation rates—may be conducive to productivity in periods of economic growth. In contrast, policy interventions targeting Schumpeterian entrepreneurship objectives—e.g., innovative entrepreneurship and the development of new technologies—yield to technical progress and, consequently, productivity growth, regardless of the state of the economic cycle (growth of stagnation). It is imperative that the economies of the European Union become more entrepreneurial to promote innovation and economic growth. To achieve these goals, we propose a reform strategy with respect to (i) the rule of law and the protection of property rights; (ii) the tax system; (iii) regulations governing savings, capital and finance; (iv) the organization of labor markets and social insurance systems; (v) regulations governing goods and service markets; (vi) regulations governing bankruptcy and insolvency; (vii) R&D, commercialization and knowledge spillovers; (viii) human capital investments; and (ix) informal institutions. Overall, the proposed institutional changes move in a liberalizing direction; however, one-size-fits-all policy reforms aimed at freer markets will not necessarily be successful. Instead, a successful reform strategy must consider country differences that affect the viability of reform without abandoning the long-term goal of institutional liberalization to promote entrepreneurship, innovation and growth. 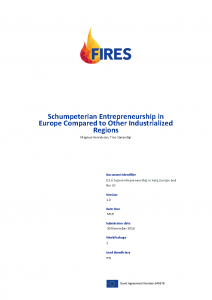 The purpose of this study is to explore whether Europe has an “entrepreneurship deficit” compared to other industrialized regions. 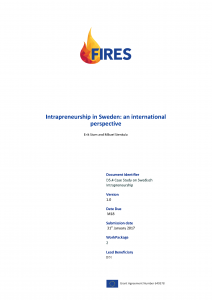 Cross-country comparisons are difficult due to the lack of standard empirical definitions of entrepreneurship. Measures focusing on small business activity, self-employment and startup rates suggest that Europe has higher rates of entrepreneurship than the United States. However, most business activity is not entrepreneurial in the Schumpeterian sense. 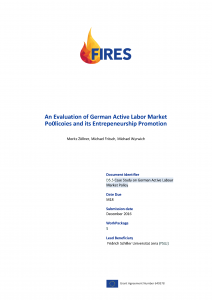 Comparisons of rates of small business activity and self-employment are therefore not sufficient to measure potential differences in Schumpeterian entrepreneurship. This paper reviews the results of studies that investigate the most important active labour market policy (ALMP) measures in Germany. A particular focus is on programs devoted to foster entrepreneurship which can make important contributions to a country’s growth and social welfare. The available evidence suggests that most ALMP measures increase labour market prospects of the participants. Evaluations of the entrepreneurship promotion activities show high success rates as well as high cost efficiency. The bulk share of participants of entrepreneurship measures is still self-employed after several years and nearly one third of these businesses had at least one employee. We mention problems regarding the evaluation of previous programs and highlight future challenges of German ALMP. 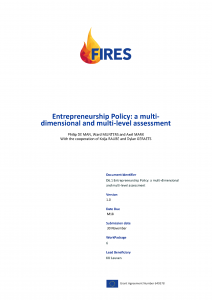 This study gives an account, as a preliminary measure, on the current state of play of EU policy on the promotion of entrepreneurship, as reflected in the various policy documents and related legislation adopted by EU institutions. Apart from avoiding overlap and ensuring innovative approaches where possible, this overview is also necessary in order to identify the key actors and stakeholders that need to be approached and engaged in order to ensure that the proposed reform agenda is workable and effective, and that the policy recommendations are addressed to the appropriate level of governance.